If you are already into web designing profession or may be in college and don’t have much time to have regular classes for advanced web designing training then you can enrol for Online Web Design Training at W3webschool. The institute is a renowned one in the field of pertaining the best quality education in the sector of Website designing. 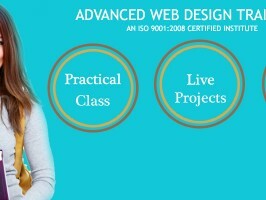 They not only provide regular classes but also provide Online Web Designing Training to the interested participants. The need of websites and online marketing is common in this world where everything runs with the help of the internet services and so do the education and since there are a huge number of students enrolling for online web designing training, W3webschool is providing 24*7 online support to the students who enrol for the online web designing training. At W3webschool, the concept building is more important than bookish knowledge. Here they prepare students for practical work rather than just to have a certificate which will fetch nothing in the real world. Even in online web designing training, the experienced faculty provides different projects to help the students and professionals to build their advanced knowledge on website designing. As one is opting for online web designing training, he or she can have access to the materials and online study sessions at any point of time and from anywhere. Online web designing training is designed for students as well as professionals who are looking for advanced level knowledge in this field. W3webschool provides knowledge which makes the candidates employable so that they can land up with great jobs, and professionals who are already working can have better knowledge and understanding of the same. Online web designing training course is of 3 months duration at W3webschool. So if you are looking for an advanced level online web designing training where you can get a 24*7 supports and access then you can opt for W3webschool. So you are interested in Web design Training Kolkata? If so then keep on reading as we are going to tell you about one of the industry’s best courses and institute that can really make you a professional Web designer, and if you are already in this field then they can improve your potentials with their advanced web designing courses they have. The institute is W3webschool situated in Kolkata and has gained reputation for its quality services in the field of technological education and especially for courses like Web designing Training Kolkata. Web designing Training Kolkata is gaining high popularity as the new companies are entering the city with thousands of projects and all companies need a website for their brand promotion and marketing. With the highly qualified and experienced faculties at W3webschool for web designing training Kolkata, they pertains the best of the knowledge required for understanding the minute details of Web designing so that you as a student can become employable and can earn a good job in the industry. With the boom in the online marketing and online shopping Web designing training Kolkata is being looked upon by many IT professionals and others students interested in this field. For advanced web designing training Kolkata one can choose W3webschool as it provides the knowledge which is not only bookish but mostly based on practical scenarios and it makes their students study and learn in a practical environment so that the ultimate knowledge is gained. At W3webschool, 3 months Web designing training Kolkata courses is there for students who have cleared 10+2, graduation, working or fresher looking for job etc. This institute not only provides quality Web designing training Kolkata but also helps students to land up with a good job. So if you are interested in Web designing Training Kolkata and looking for advanced knowledge then W3webschool can be the perfect place for you.